Love them or hate them, but it is difficult to deny the huge role emojis play in how we communicate in modern times. The tiny images make our text-messages come alive, and new research shows people respond to emoticons the same way they would to an actual person, encouraging us to increase our interactions with one another. These little graphics on our mobile devices have come a long way from their birthplace of Japan. Initially created by the country’s premier mobile carrier, NTT DoCoMo, emojis were first launched as a set of 172 pictographic images to accompany the company’s messaging platform. The characters were a quick hit with Japanese consumers, and as mobile messaging services expanded globally, emojis came along for the ride, demonstrating their global appeal. But are emojis helping reenforce gender stereotypes? Makers, the digital and video storytelling platform of women’s stories, is criticizing emojis’ collection of female images, charging that choices for young girls remain limited to being brides and princesses, partaking in activities such as salsa dancing. While Makers commends the recently diversified updated emoji alphabet, which includes emoji with a variety of skin tones, sexual orientation, and even professions, when it comes to women and girls the options suddenly run slim. It seems as though even in 2015, when it comes to women’s rights our everyday technology is stuck in the 1950s. 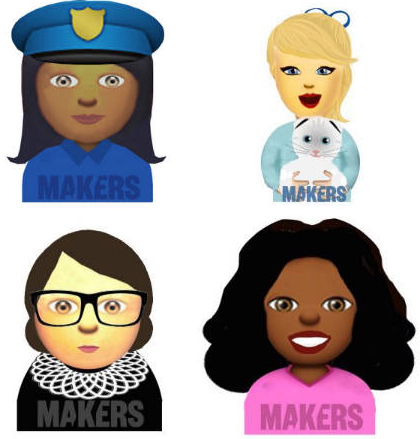 “Compared to larger global women’s issues, emojis may seem insignificant, but these tiny characters have become the primary language young girls use to express themselves in text messages or on social media,” Makers says. 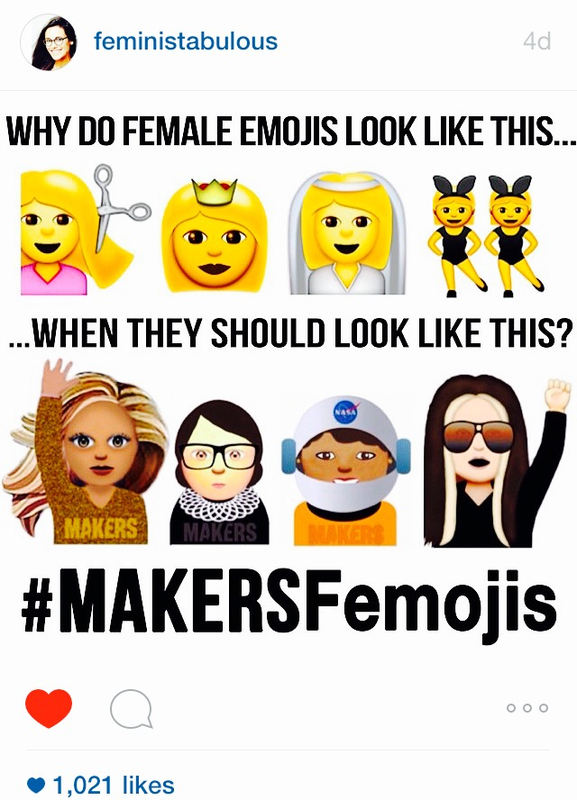 If you are having difficulty actually visualizing what empowering emojis, Makers is already a step ahead. By designing femojis such as feminist icon Gloria Steinem, Supreme Court Justice Ruth Bader Ginsberg, comedian Mindy Kaling, media tycoon Oprah Winfrey, and pop diva, Beyonce Makers is telling Apple, and other mobile developers, that to really make an effort to advocate diversity, they need greater representation of women in their emoji alphabet. Anything would really send the wrong message to girls. Limiting the roles we see women and girls depicted in emojis is also equally damaging for boys. Why limit a young user, regardless or gender, in the roles they should be conditioned seeing women in? If emojis are to be a permanent fixture in our global tech communication, is it not better they encourage girls to be business moguls or lawyers over princesses? We should treat emojis the same way we approach advertising and products aimed at children. Bottom line? Messaging to our youngest consumers, our next generation should be one that teaches and encourages diversity and equality across the board. While Makers deserves a huge applause for making us expand our vision of emojis, the next move is up to tech giants, like Apple, to make Makers’ femojis come to life. By including them in their next IOS update, Apple could play a huge role in creating the next generation of feminists, and empowering young girls’ vision. Mobile companies should seize this opportunity. I know I would take the Oprah femoji over the bride or salsa dancer emoji any day. And I hope my daughter would, too if she had the choice. Next PostThe Default Response: Are Only Muslims Terrorists? I had no idea femojis even existed! They don’t yet, but hopefully soon?